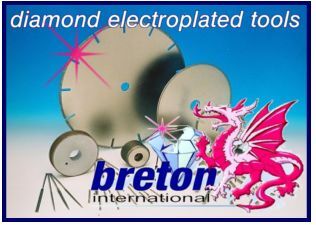 Breton International manufacture the very best quality electroplated diamond tools from the smallest internals up to the largest diameter wheels. Electroplated tools are made from a single layer of either diamond CBN or Synthetic particles then are bonded to the tool surface by a nickel matrix. This bonding process allows the manufacture of tools with various forms and shapes to be produced. Plated tools are very free cutting and have high stock removal and exceptional form holding characteristics. A major advantage of plated tools is that they can be stripped and re-plated at a reduced cost. Tools made from mild steels, aluminium, stainless steel, brass etc, can all be plated and re-plated. Examples of plated products available are form wheels, cup wheels, cutting discs, files, holesaws, bandsaws, speedpins, 'V' wheels, twistdrills etc. Diamond plated products can be used successfully on the following materials: Glass, Quartz, Carbides, Fibreglass, Brake Linings, Stone, Ceramics, Carbon, Graphite, Silicon, Porcelain, Marble and many more. As it is not possible to cover every product due to the enormous range, therefore if you require any further information or a quotation please do not hesitate to contact us via our web site or office. Breton International, Jubilee St, Llandudno, Conwy, LL30 2NZ, UK.